InnoVint is cloud-based wine production software that enables real-time data entry using mobile devices. Our platformdesigned by experienced winemakers and top engineersis intuitive, flexible and models every step of the winemaking process. InnoVint puts real-time data at your fingertips, giving you superior insight into your operations to help you and your team make better wine, together. InnoVint's mobile record-keeping eliminates paper records and duplicate data entry. You can record activities, additions and analytics via mobile devices anytime, anywhere. Work orders are created and assigned digitally. Cellar staff receive them on a mobile device, enter the requested data, and complete them as the work is performed. Work orders are editable and flexible so you can confidently plan both your long-term monthly topping schedule and last-minute work during harvest. InnoVint provides a variety of mobile options to fit your unique winery environment, from fully-featured tablet access to mobile apps for iPhones and iPods. Each user has their own permission-based account allowing everyone involved and interested in production analytics to find value in InnoVint, from the owners to the interns. InnoVint easily manages the various relationships you may have with internal and external stakeholders at your winery. You can manage multiple bonds at one location and group inventory by custom crush client or AP. Winemaking consultants are able to toggle easily between all their clients from a single interface. InnoVint supports winery compliance by reporting on gains and losses to make monthly, quarterly, or annual 5120 (702) report submissions. We never charge per user, per device, or per feature, encouraging full adoption across the cellar and lab. When we make upgrades and add new features, they are automatically added to every account without any winery interaction. These features are just the beginning! Contact us to explore all that InnoVint has to offer. InnoVint\'s mobile app allows for complete inventory monitoring, digital work order completion, and entry of real-time activities. Lots in InnoVint are elegantly managed with intuitive icons and names, making lot inventory management a breeze. Lot detail pages give you just enough information to know the most recent activities and analytics. Want more detail? It\'s just a click away. Get to know what InnoVint is all about! Whether your winery brings in 5 tons or over 5,000 tons a year, crafting grapes into wine requires planning, structure, and capital investment. Without a good management system in place, all that work could be compromised at any point. Since labor is still a significant component of winemaking, investing to improve your operations will allow you to maximize your team’s potential and yield the highest quality end-product. Modern wine production software should be the foundation to manage this. Not all wineries share the same workflow procedures or winemaking styles, but there are some shared strategies many wineries use to improve their wine quality with winery production software. We’ve all been a part of simple mistakes resulting in quality compromises and inventory losses. Were a majority of these mistakes preventable if you had spent more time structuring processes and workflow? I bet so—especially during harvest when staff is tired and often overworked. Having reliable SOPs and accountable steps to follow for any given task will narrow this window for error, which in turn has undeniably positive effects for overall quality management and risk mitigation. We all know the potential for a wine’s quality is set by the vineyard. The days of sifting through your three-ring viticulture binder should be over. Having real-time insight into vineyard trends and seasonal data with strong vineyard management software is essential to be forward-thinking about future vintages and to understand how to maximize quality. Why would you pay your winemaker $40/hour to spend 50% of their time maintaining spreadsheets? You’re throwing away money on your most valuable personnel. Keep them focused on what builds the most value to you, which is spending time in the vineyard and cellar, tasting, networking, and growing professionally, not stagnating behind a computer. Enable them with tools that allow them to do their job from anywhere and access the information they need at their fingertips to maximize your wine quality potential. Select technology tools that allow your team to be most effective at their job. Whether that be utilizing a digital work order system, pushing production software notifications to your personal phone, or using mobile apps that capture and contain your production data, it’ll make your operations that more efficient and save time and money in the long run. Happy employees do better work. It’s just a fact. There’s no doubt that when employees feel empowered, are given the freedom to explore their art, and are encouraged to have fun produce better outcomes. Give them what they need. Allow them to do their work from where they’re most effective. Invest in technology that excites them andprovides the structure to simultaneously improve your wine quality. Provide your team with an environment where they can flourish, and your business will in turn. Ultimately, winery management software can simplify and optimize your workflows and processes. That leads to fewer (and less costly) mistakes, more transparency throughout production, improved team accountability and dedication, and, ultimately, to produce the highest quality wine possible. InnoVint empowers winemakers to maximize their potential – as artists, as scientists, as managers, as operators, and brand promoters, as your employee. 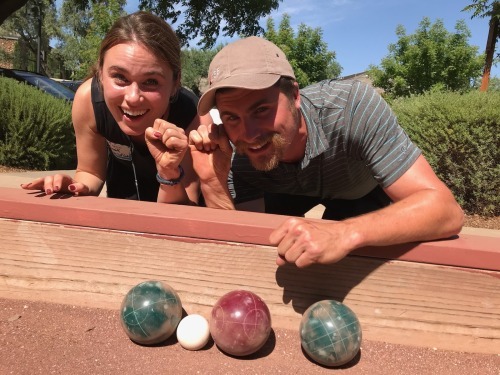 We remind them how fun winemaking can be, allowing them to get back to their craft they fell in love with 100% of their focused efforts on making the best wine possible. Contact Lindsay Wicka at lindsay@innovint.us or call 707-204-3817 x 2 to schedule a demo today. As you explore your options for production software, there are many important considerations. In our buyer’s guide, you’ll learn the right questions to ask and how to properly vet providers to determine what's best for your winery. You're not alone in this struggle. And you're in luck. Join the hundreds of wineries who've already discovered there's a solution to 4 common post-harvest anxieties. 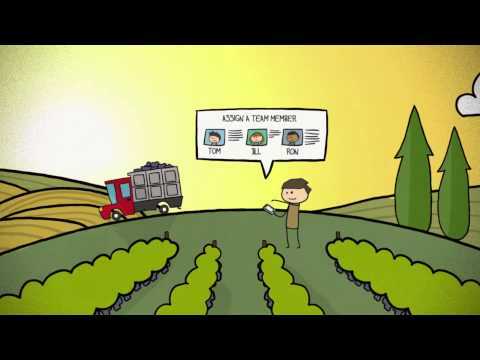 Meet InnoVint, the leader in wine production management software. For a demo contact us at jarred@innovint.us or call 707-418-0119, Ext 1. January 29-31: Unified Wine & Grape Symposium. Sacramento, CA. February 12-13: Oregon Wine Symposium, Portland, OR. Let's kick your operations into high gear! We look forward to meeting you. Winemakers, viticulturists, cellar masters and compliance officers can now say goodbye to cumbersome paper tracking and redundant data entry thanks to a revolutionary new software management tool offered by InnoVint, one of the wine industry’s top software development companies operating today. Founded by UC Davis trained and experienced winemaker Ashley DuBois Leonard, the InnoVint Platform is the first mobile-focused management system that allows for real-time data entry as well as real-time data access anytime, anywhere. The InnoVint platform features single point data entry simultaneously available to team members across multiple locations. The system also offers QR Code Vessel Tracking; Additive Batch Tracking & an Addition Calculator; ETS Laboratories Integration; and an Owner Based Permission System for custom crush clients and alternating proprietors. Leonard DuBois notes that the InnoVint system is appropriate for all levels of winemaking. Boutique to mid-size wineries can use it to streamline operations, large wineries can employ the software to minimize risk and maximize profits, and custom crush clients are able to track and access all data on their specific wines by bond or by location at any time. “Customers are very happy with our product and service,” DuBois Leonard points out. “We have an excellent to world class customer loyalty rating, according to the global Net Promoter Score (NPS) standards. For more information and a product demonstration, go to https://www.innovint.us. "Hey, winemaker, how much did it cost to produce that wine?" You might be asking yourself, “But I’m a winemaker not an accountant. This isn't my job.” Well, not to be the bad guy here, but it does concern you. You're responsible for getting production information to the people running the numbers. These financials are critical to understand the overall health of the business. Don't worry - we're not asking you to spend all your time behind your computer trying line item all these costs out on paper. There is a better solution. Keep reading. First thing's first though. Let's start with definitions. Okay... so what are production costs anyway? The bookkeeping term is “Cost of Goods Sold” (COGS). COGS are the direct and indirect costs attributable to producing your wines – the actual amount you spent on the grapes, the barrels you used, the sulfur you added, the packaging for your wines, even your own salary. Adding all of these together helps your winery understand how much they are making in profit for each bottle they sell. But I'm not tracking costs yet. Where do I start? Now is your chance to WOW your colleagues. You want to be as valuable a winemaker as you can being in such a competitive market. Get ahead of the curve by implementing production software that manages costs for you! InnoVint has built-in cost tracking embedded in production operations that manages all cost categories to provide you a comprehensive costing snapshot at any point in time. As you take your wines through normal winemaking operations, the system will automatically distribute costs across your volume movements. You can even manage overhead costs like utilities or salaries and apply them across all your cellar volumes as of a previous month end or date in the past. Since it’s already easy to manage all of your wine movements and inventories in InnoVint, tracking costs becomes almost effortless. Even better, grant limited access to your accountant to manage it themselves! Watch our Costing Overview Video for a deeper dive into how it works. We'd love to have you join us for a customized demo to experience how InnoVint can help your winery track your costs, generate your TTB 5120.17, streamline all of your production data, and much more, all in one place. Make 2018 your most successful harvest by joining InnoVint! Get up and running in as little as 1 day. Whether your winery brings in 5 tons or 5,000 tons, getting ready for harvest takes time, sufficient planning, and financial investment (enter harvest intern expense). However, all that work could be compromised if there isn’t proper organization throughout the entire process. Without it, you might end up burning yourself out. That is when mistakes start to happen, details fall through the cracks, and your level-headed state of mind becomes threatened. Although not all wineries share the same workflow procedures or winemaking styles, there are some shared ways to avoid many operational headaches. We spoke with some of our boutique producers, as well as some of our larger clients, on their secrets to maintaining, if not increasing, wine quality and preserving their sanity during this chaotic time of year. Having the ability to record and access fruit maturity and phenologic data from anywhere, including right in the middle of your vineyard. And being able to access historical data when identifying problem blocks, as it can help you craft proactive strategies to ensure quality this year and for years to come. Don’t get caught without a home for your fruit! Using real-time vineyard data, estimate your pick dates in advance, especially for your largest lots. This helps to ensure that you don’t have to hold fruit in the cold room (if you’re lucky enough to have one) until space frees up which could compromise quality. Get your Brix and Temperature readings recorded into your software the second it’s taken by your team, thereby giving you instant access to any problem spots that may arise. We all know how critical catching those temperature spikes can be and how a slight slip-up could affect quality. Get notified of your external lab results the minute they’re posted. Making sure your production software enables automating analytic uploads allows you take instant action on the results. You won’t have to wait for an email and manually enter the results into your database or spreadsheet to make those time-sensitive decisions. Wandering around barrel rows wondering what they contain? There’s an easy solution for that. Label them with pre-populated stickers containing lot and barrel information so you know exactly what it is, all the treatments the lot has had, and recent analytics. A QR code takes it a step further, allowing you to quickly scan the barrel with your mobile device to access all that information digitally. And hey, while you’re at it, why don’t you send out a work order right there on the spot using your tablet! Imagine this - when harvest is over, you’re actually done! You don’t have to spend days or weeks at your desk updating your records from those piles of paper work orders. Software has come a long way in the past decade to allow for mobile entry of daily harvest information and cellar workflow. With a digital work order system, it’s quick and easy to assign tasks to your team, monitor their progress, and validate their work before it’s recorded. Say hello to your future! You can now focus all those wasted data entry hours spending time with your wines. Who knows, maybe you’ll find a little extra room in your budget to invest in that special project to take your wines to the next level! You won’t know until you start tracking costs, and over time you can use historical data to make better, more informed decisions that increase profitability. Stop spending time each month, quarter or year shuffling through all that paperwork to reconcile your gains and losses - look for ways to automate and simplify the process. We know you’d prefer to spend your time in the cellar focusing on your wines, and that’s how it should be! Finding a solution that knocks out all 8 of these stressors is not a challenge. InnoVint’s intuitive and powerful winemaking system hits the mark on all of them and ensures that you have the tools to create the best wine possible, without all the headaches. We’ve worked hard to develop a software that allows you to improve overall wine quality, and your business -- that’s a winning combination you can’t ignore. There's still plenty of time to get started with InnoVint prior to harvest! Our winemakers on staff are ready to cater our product to your needs. Tell us a little about yourself at info@innovint.us or give us a ring at 707-418-0119. 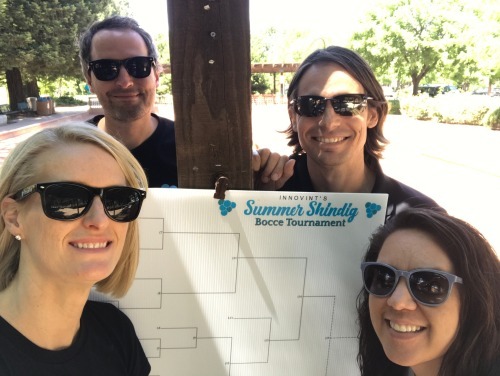 Summer Shindig and Bocce Tournament Success! A giant THANK YOU to everyone that attended our Summer Shindig in Yountville last week! 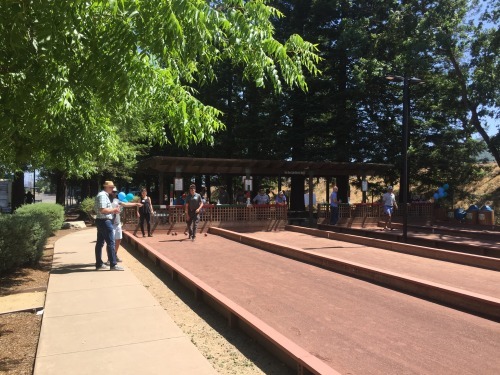 We had a blast hanging out with everyone over some really fantastic wines, delicious food (thanks to the crew at Marks The Spot Food Truck), and some pretty intense games of bocce. 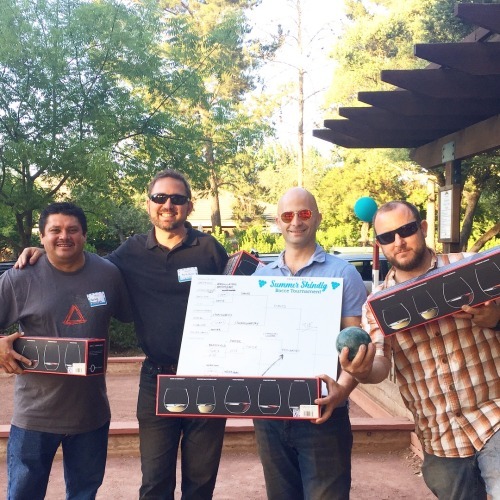 Congratulations to the tournament champs from Colgin Cellars, Brassfield Estate, and Davis Estates! As winemakers ourselves, we’ve been there. We yearned for winemaking-specific software to help us to track our cellar work in real-time and make our jobs easier. Excel and other databases weren’t cutting it, but switching to a different system seemed burdensome and costly. Solving this issue is one of the many reasons we created InnoVint back in 2013. With InnoVint’s real-time winemaking platform, transitioning from your current system has never been easier. Whether using Excel or another database, we make the switch quick and painless so you can be up and running with InnoVint in as little as 1 day. We pride ourselves in having the fastest self-service activation on the market. 4) Start working with InnoVint! When you have questions along the way we have a super helpful Online Help Center with videos, tutorials, tons of product screenshots, and step-by-step instructions to follow. · No system setup - We maintain current, industry-generated lists of toasts, coopers, varietals, all approved appellations, you name it. You don’t need to set this up - it’s already locked and loaded. · We work with exports from your existing spreadsheets or database – Since most of our clients are making transitions from other systems, we have export maps that allow us to get your inventory into our system quickly and easily with little to no effort by you. Still not sure if it’s worth it? Take her for a spin. We offer a 30 day risk free guarantee. If you’re not happy, you’re released from the agreement, no questions asked. While this streamlined setup process satisfies our small to mid-size wineries, large producers and custom crush providers often need a multi-phased roll-out across their larger team and/or locations. We offer enterprise-grade implementation plans customized to your unique operation. No matter your model, you’ll be happy you made the switch. We can put you in touch with many neighbors of yours that are proof of this and would be glad to speak with you. Bud break arrived early this year in the Napa Valley, kicking off the beginning the 2018 growing season. Although it feels as like the 2017 harvest just finished, winemakers across the country find themselves less than 4 months away from beginning to receive fruit. What is on the top of your wish list to have by harvest? Unfortunately, not all budgets are created equal, and we all don't have room to buy that new optical sorter or concrete egg we have always dreamed of. But one thing we can all squeeze into our budget is InnoVint Production Software. Often times the link between wine quality and production software is overlooked. Truth is, utilizing our software will not only ensure that you make better data-driven decisions, but will also help keep you organized and on top of your ferments and aging wines, leading to higher quality wine. Our cloud based system will keep your data safe, while allowing you access to your real-time data from anywhere you have cell phone service or internet. This way you can track work being done in your winery while away, or even log vineyard data while out in the vineyard. With prices starting at $129/month, we can work with just about any budget. Prices are on a sliding scale, based on annual production volume and opt-in features. Our system was built by Winemakers for Winemakers with the intent to help you run your winery in the most efficient and effective manner. Contact us today to setup a demo so can see for yourself why we are the most intuitive and well respected name in Winery Production Software. Avoid mistakes in the cellar by utilizing our QR codes on all of your vessels. This allows for quick scanning from your mobile device to complete work orders, or check the status of a vessel or wine lot. This is part of our core system and doesn't require any additional hardware. Have you ever wondered how much it costs you to produce your wines? Have you been searching for an efficient way to track the cost of production? Our robust costing feature will track your production from grape to bottle. InnoVint has a new, direct integration with Baker Wine & Grape Analysis, located in Paso Robles. Analyical results from wine and juice samples can be uploaded directly into InnoVint and automatically associated with your lots in InnoVint. Once uploaded, the analytical source is identified by displaying the Baker logo next to the value. This way, the source of every analytical value entered or uploaded into InnoVint is always known. Learn more about InnoVint mobile, real-time production software: https://www.innovint.us or by contacting us at info@innovint.us. Government agencies kissed their holiday break goodbye when President Trump signed the Tax Cuts and Jobs Act on December 22, 2017. Most of the provisions took effect just 10 days later on January 1, 2018. Taxation agencies scrambled to make sense of it all (and many still are), one being the TTB, the Alcohol and Tobacco Tax and Trade Bureau. 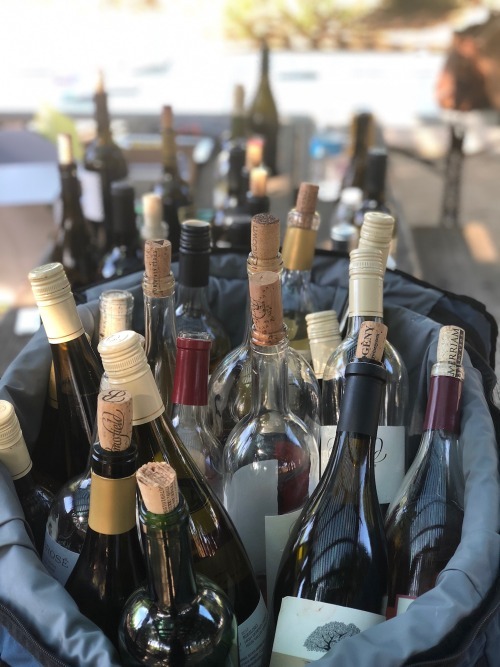 We’ve all been studying the same TTB-regulated tax classes for years: Are my still wines less than 14% alcohol by volume (taxed at a rate of $1.07/gallon) or between 14 and 21% (taxed at a rate of $1.57/gallon)? These new regulations have now changed the curriculum. The TTB increased the lower bracket from less than 14% to less than 16%, thus changing the upper bracket to 16-21%. In general, higher alcohols have been favored in recent years (blame it on stylistic preference, global warming, and/or millenials if you will) to the detriment of winery excise tax rates. Given that most table wines range from 12% to 16% ABV, this has significant implications for most producers. For those that produce wines between 14-16% ABV it’s a welcomed change that will save them hundreds if not thousands of dollars a year. In order for wineries to realize the financial gain from the lower tax rate TTB reporting needed to get buttoned up… fast. Wineries that rely on InnoVint to maintain their wine inventories and generate their TTB 5120.17 reports turned to us for answers. We didn’t want to jump the gun and deliver an updated form before the TTB had done so. We patiently waited them to make their move first. January quickly turned into February, and as the first reporting deadline of 2018 (February 15th) crept closer and closer we were all holding our breath for the changes. Finally, on February 9th, the TTB released the updated 5120.17 form and we jumped to action. We highlighted pertinent sections throughout InnoVint and provided thorough instructions to assist with the re-assignment of tax classes in order to keep our client’s 2018 5120.17 reports aligned with the new legislation. We understand that maintaining compliant records can sometimes provoke.... strong feelings. We get it: the 5120.17 isn’t everyone’s best friend. Wineries are always on a deadline and when things come down to the wire it can be difficult to pull everything together when your focus has been on winemaking. This is one of the reasons why production software is such a crucial tool for wineries of all sizes. You should be able to trust your software provider to stay up to date with regulatory changes and take action immediately when needed. At InnoVint we take great pride in our reputation as a reliable, dedicated service provider. The TTB regulatory changes are just one example of our fast response times and our commitment to excellence. InnoVint, the leader in real-time production software, released the new "recurring work order" feature that builds upon their existing robust digital work order platform. Recurring work orders allow for a digital work order to be scheduled at future dates and at intervals of your choosing. Perhaps you want to stir your chardonnay barrels every week, top your lots every 6 weeks, or ensure your tanks are gassed on a regular basis. Remove all your redundant reminders and work solely within InnoVint for all your current and future wine production activities and workflows. Learn more by visiting www.innovint.us, writing to info@innovint.us, or ringing 707-418-0119. Do you know the cost of your finished wine? InnoVint Wine Production Software will be demoing our new cost tracking feature at Unified Symposium! Visit us at Booth #2507 (upstairs behind registration in the 3rd floor ballroom). We look forward to showing you all our new and sneak peak features! TTB, FDA, CDFA, oh my! If you're not currently utilizing wine production software chances are you're toeing the non-compliance line. And if this is the case, an audit by the TTB, FDA, CDFA or even your local weights and measures department could yield expensive fines or, worse, recalls from market. Now is the perfect time to consider implementing a modern, intuitive platform to ensure your future compliance and piece of mind. Why not adopt a system that streamlines your operations and efficiency as well? InnoVint makes it super easy to get started and it's a breeze to train your team. By relying on InnoVint's real-time system for your day-to-day operations you don't have to be concerned about a potential audit. Whether it's the FDA, TTB, or an audit of your weight tags we got you covered by providing quick access to the resources they require. Contact InnoVint today for more information! Email info@innovint.us, visit www.innovint.us, or call 707-418-0119 extention 1. Are you ready for a winery audit? If you're not currently utilizing wine production software chances are you're toeing the non-compliance line. And if this is the case, an audit by the TTB or FDA could yield expensive fines or, worse, recalls from market. Now is the perfect time to consider implementing a modern, intuitive platform to ensure your future compliance and piece of mind. Why not adopt a system that streamlines your operations and efficiency as well? InnoVint makes it super easy to get started and it's a breeze to train your team. By relying on InnoVint's real-time system for your day-to-day operations you don't have to be concerned about a potential audit. Whether it's the FDA or TTB we got you covered by providing quick access to the reports they require. Contact InnoVint today for more information! Email info@innovint.us, visit www.innovint.us, or call 707-418-0119. InnoVint has released a deep integration with ETS Labs and their analytical testing service. Analyical samples from wine and juice are pulled directly within InnoVint, a real-time mobile-driven production tracking platform, and sent to ETS. Once the results are posted InnoVint automatically associates the results with your lots and vessels without any data entry. Learn more about this feature and InnoVint by emailing info@innovint.us. InnoVint has a new advanced integration feature with FOSS wine analytical products. The wine quality control parameters map directly to InnoVint, allowing for a seamless capture of your sample results per lot and vessel, along with the date and timestamp. Learn more about this feature and InnoVint by emailing info@innovint.us. Stop wasting time chained to a desk a slave to spreadsheets! Do you spend far more time at your desk than you'd like managing your spreadsheets and database? What if there was software that eliminated this work for you, where all your winemaking data was recorded on the spot by your team into a shared cloud-based mobile platform? Check out InnoVint. Your modern winemaking platform with a human touch. Many of your peers are already on board and loving it. It's quick to learn and easy to use. It can take less than a day to be up and running. We offer inventory import services if needed. Our clients love us. In our October 2016 survey, 100% of respondents said that InnoVint meets their needs Extremely Well or Very Well, and 100% rate the value Excellent or Above Average for the money. We cater to you. Large and complex or boutique and straightforward, we've got you covered. Our subscription packages scale accordingly with no secret fees or unexpected add-ons. Reporting is a breeze. Whether internal operations require consistent reporting or you're executing your TTB 5120.17 report, we deliver everything you need to conduct your business effectively and efficiently. Features galore. Vineyard tracking, activity calendars, mobile notifications, dry good tracking and additive calculations, custom crush permissions... and more! Ready for a customized demo, proposal, or free trial? Contact us right now! Email info@innovint.us or call 707-418-0119, Ext 1. We'll be in touch shortly. InnoVint, the leader in real-time mobile production software, is thrilled to announce a new and exciting feature that grants custom crush clients and other winery stakeholders controlled access to InnoVint. The platform tracks every inventory item specific to it's owner(s) and users are assigned an access level: Admin, Team Member, or Read-Only. Clients can access their inventory anytime, anywhere, can assign digital work orders, and can run reports and compliance exports without host winery interaction. Being a custom crush provider has never been easier! We'd love to share our successful case studies with you. Please contact info@innovint.us to learn more about everything InnoVint has to offer. InnoVint will be showcasing their mobile, real-time cellar management platform as a Platinum sponsor (booth #402) at the upcoming North Coast Wine Expo on Thursday, December 3rd at the Santa Rosa Fairgrounds. This is your chance to talk to the passionate team about what they've built and experience the platform for yourself. Bring your team and learn how automating workflow and having a real-tiime system benefits everyone, from the winery owners to the harvest interns. If you have questions beforehand please don't hesitate to contact InnoVint directly at 707-418-0119 or info@innovint.us. San Francisco, Calif. – InnoVint, a new winery software company in the San Francisco Bay Area, announces the release of their real-time wine production software that tracks every operation from grape to bottle. The cloud-based system is the first of its kind to utilize mobile devices for data entry and work orders. InnoVint works on a multitude of devices, from desktop computers and laptops to tablets, iPhones and iPods. The user interfaces are pleasing to the eye with intuitive icons and flexible process flows that simplify complex wine operations. Winemaking activities can be logged in real-time directly through the mobile app, or tasks can be assigned and completed digitally in a work order. The platform provides a comprehensive view of each wine in the cellar and detailed reporting of all wine activities, additions, and analytics at any point in time. In late 2013 the company began partnering with select wineries in Napa and Sonoma to develop the functionality and test the software as a part of a Beta program. Today, these winemaking teams have opened up about their experiences with InnoVint. InnoVint has ambitious plans for its software offerings. 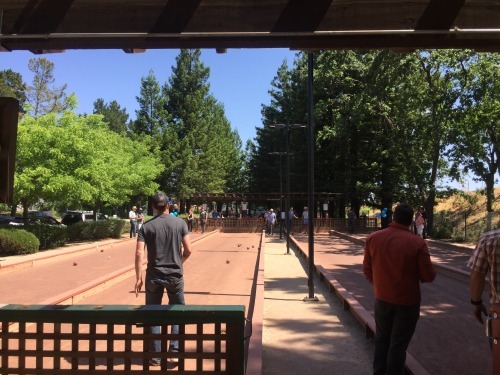 “We are a passionate, talented team of winemakers and engineers excited to show the wine industry how accessible, valuable, and fun great software can be, while at the same time tackling real problems no one has solved yet. There’s a lot more to come from us,” says Andrew Headrick, Co-Founder and CTO of InnoVint. InnoVint is now accepting new winery clients. To learn more about InnoVint, please visit www.innovint.us. You can also follow the company on Facebook and Twitter at @goinnovint.